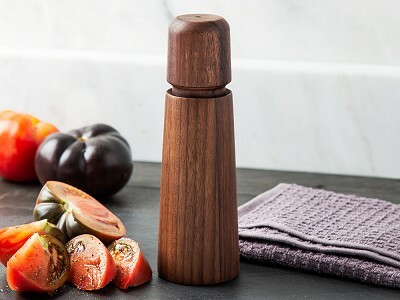 Pepper mills and spice grinders with a steel grinding mechanism are pretty common, but you might not know that ceramic grinders do a better job with salt, pepper, and dried spices. Unlike a steel grinder, the ceramic grinders from CrushGrind will keep grinding year after year, and won’t corrode with exposure to salt. They have adjustable coarseness, too, to suit your taste. Speaking of taste, grinding dried spices helps them taste fresher by opening up aroma and flavor and is an easy prep step that elevates your dishes. This handheld spice grinder works with things like dried cloves, fennel, cardamom, and other spices. 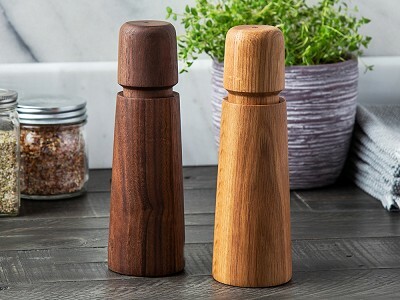 And the heirloom-quality pepper mill and salt grinder are made with American wood and Danish design that results in a timeless, table-worthy look. Ken Lassen of CrushGrind has been spearheading a ceramic grinder revival since the 1990s and he’s so committed to quality that these ceramic kitchen helpers are guaranteed to last for 25 years. Yes. The grinder is made of high quality ceramic that is guaranteed to last for 25 years. The ceramic will not corrode. 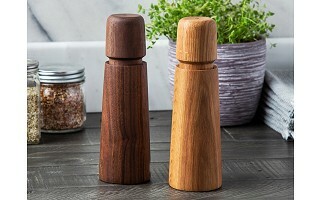 Is the mechanism different between the salt, pepper, and spice mills? No, the mechanism is the same.